Every spring I am amazed at the return of birds that have flown south for the winter. The distances they cover and the obstacles they overcome are enormous. How do they find their way? How long does it take them to fly the entire journey? How do they know it is time to return? Published in 2007, Atlas of Bird Migration is a full-colour guide to the mysteries of bird migration that features all of the latest science, including the results of advanced satellite tracking methods. 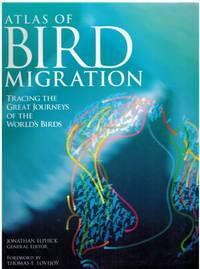 It contains an illustrated introduction that explains the background to bird migration: flight techniques, navigation, feeding, timing, staging posts and biology. Computer-generated maps trace the migration routes of more than one hundred species. Information on size, weight and wingspan, journey, distance and timing is provided. The routes of 500 migrant bird species are cataloged. The essays in this book focus on environmental threats to migratory species and conservation initiatives worldwide. It also includes bird watching tips about the best times and places to observe migrants. This superb publication is a great resource for students. It is also an excellent read for serious birders as well as those, such as myself, who just want to know. Doomed to- or blessed with – eternal life after drinking from a magic spring, the Tuck family wanders about trying to live as inconspicuously and comfortably as they can. When ten year old Winnie Foster stumbles on their secret, the Tucks take her home and explain why living forever at one age is less a blessing than it might seem. Complications arise when Winnie is followed by a stranger who wants to market the spring water for a fortune. The major characters are Winnie Foster, Jesse Tuck, Mae Tuck, Miles Tuck and Tuck. The story is set in rural “America” in the late 1800’s and written in omniscient voice. The theme is good vs evil and the story has a bitter sweet ending. This story is told in the third person, past tense and flows easily from page to page. The dialogue is superb and realistic, the characters believable. The ending is a bit abrupt, but perhaps that is intended to portray the sudden end to life, no matter how well planned. I felt as though I had been left hanging, details about what ensues for the assistant, missing from the narrative. Even with that, I would recommend this as a quick and satisfying read. It’s time for Grizzle Grump to hibernate and he can’t wait. Each time he thinks he’s found a good spot there is too much noise for him to sleep. Will Grizzle Grump ever find the perfect place for his long winter nap? This beautiful picture book is for 4 to 8 year old children. It goes through the typical story telling pattern of things happening in threes before reaching a satisfactory conclusion. The repetition of words will help young readers recognize them as well as making it somewhat predictable and comfortable for little ones to listen to. The action and sound effects will make it a favourite bedtime read.